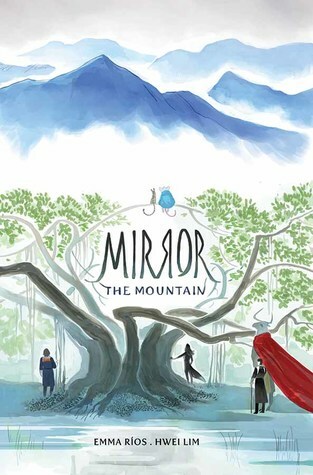 Review: I came upon Mirror: The Mountain by happy (very, very happy) accident at the library. The moment I flipped it open, I recognized the art style as that of an artist I follow on Tumblr (lalage) and knew I had to get it. The whole time I was checking out the book, I gushed excitedly about it — I had no idea this artist had a comic book out. Look at how gorgeous it is! And so on. But seriously, the art is truly beautiful. Each panel is worthy of framing on your wall by itself. The story itself perfectly matches the fluid, painted look of the illustrations. The whole thing is told in flashbacks and moments that all weave together into one narrative. At times, it can be difficult to figure out exactly what’s going on, but you get the hang of it eventually. In Mirror: The Mountain, people live at odds with animal-human hybrids, guardian animals, and more. The story comes together in bits and pieces, illustrating the history of the people on the asteroid, and the rebellions and battles of years gone by — all centering specifically on Ivan, a powerful human mage, and Sena, a dog-human hero who wants to free the animals of the asteroid. The volume is worth picking up for the art alone, but the sci-fi/fantasy story takes the graphic novel to the next level. It’s an amazing combination of the mythological and the environmental, and I am absolutely looking forward to the next installment. If this sounds like your kind of thing, definitely get it! And if you’re unsure, check out the incredible art of Hwei Lim here.